Follow us on ReverbNation for our latest music, and updates on where you can hear Unforgettable Big Band live. Visit our YouTube channel for great video clips and highlights from past Unforgettable Big Band performances. Follow us on facebook, and join our active and ever growing social network community of nearly 2500 friends and fans. Visit our CD Shop on CD Baby to purchase our music for yourself, or to give as gifts to your music loving friends. Celebrating more than 15 years of delighting audiences throughout the Susquehanna Valley region of the United States, Unforgettable Big Band pays tribute to great artists such as Benny Goodman, Glenn Miller and Artie Shaw who represent the glory days of swing. We also perform new big band literature and arrangements from Gordon Goodwin, the Brian Setzer Orchestra, and even Carlos Santana, Queen, and Bruno Mars. Our vocalists honor the great singers of the big band era, from Peggy Lee to Doris Day, and from Cab Calloway to Frank Sinatra, Bobby Darin and more. Unforgettable Big Band is a community big band based in York, Pennsylvania that draws some of the most talented musicians from all across the region who are interested in maintaining the vitality of music from the Big Band era. The band has performed throughout the region, and become one of the area's best known and most liked bands. As a community band, service is a part of our mission. It is our desire to give back to the generations that have paved the way before us. The band is available for parties, receptions, special events and corporate functions, in addition to traditional dance and concert engagements. We endeavor to accommodate worthy fund raising efforts, as well. Currently organized as a non-profit corporation, Unforgettable Big Band is dedicated to continuing the American big band tradition. For more information, or to schedule the band for your next event, please follow the other links on our website, or send us an email through the "Contact Us" link above, and we will get back to you with information on how you can make your next celebration Unforgettable. Unforgettable Big Band is pleased to announce the upcoming release of our third CD recording. We were able to capture outstanding audio during our December Sinatra Centennial concert series at York Little Theatre, through the efforts of audio engineer Tom Miller and Tritone Mobile Recording, and due to numerous requests, we will be releasing most of the performance as our first live concert CD release. On December 12, 2015, the legendary Frank Sinatra would have celebrated his 100th birthday. As a tribute to the man and his music, Unforgettable Big Band presented Sinatra Centennial, a concert performance of Frank's best known and loved music, at York Little Theatre on December 11 and 12. The performances were both played to sellout crowds, and became Unforgettable's most talked about performances in our 15 year history. Carlisle United Methodist Church is sponsoring their second annual Spring Prom on June 3, 2016 in the church multipurpose room. Unforgettable Big Band will return once again to provide the entertainment. This year's theme is "Sailing Beyond The Sea," and the band will pay tribute to Bobby Darin, who would have turned 80 this year. Unforgettable Big Band will team up once again with the Veteran Service Committee at Elks Lodge #213 to present the 3rd Annual Big Band Brunch on May 29. This event will take place once again on Memorial Day Weekend at the lodge on North George Street, and will feature great food and music for a great cause. 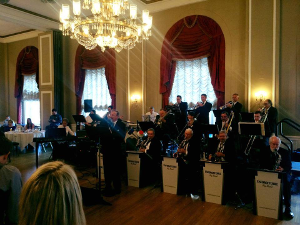 This year, the Big Band Brunch benefits the Vets Build project of York Habitat for Humanity. Last year's event raised more than $3,500 to assist in the roof project for the Sandie Walker Drop In Center for Homeless and At-Risk Veterans, and we hope to top last year's total. With winter taking a firm grip on the Susquehanna Valley region, a reminder that Spring is just around the corner, and with it will come Unforgettable's 13th annual appearance at the Lake Meade Homemakers Dance. This fundraiser is our longest standing performance, one that we began when the band was just two years old. The dance has become an annual tradition at Lake Meade, and has raised more than $25,000 for local charities.